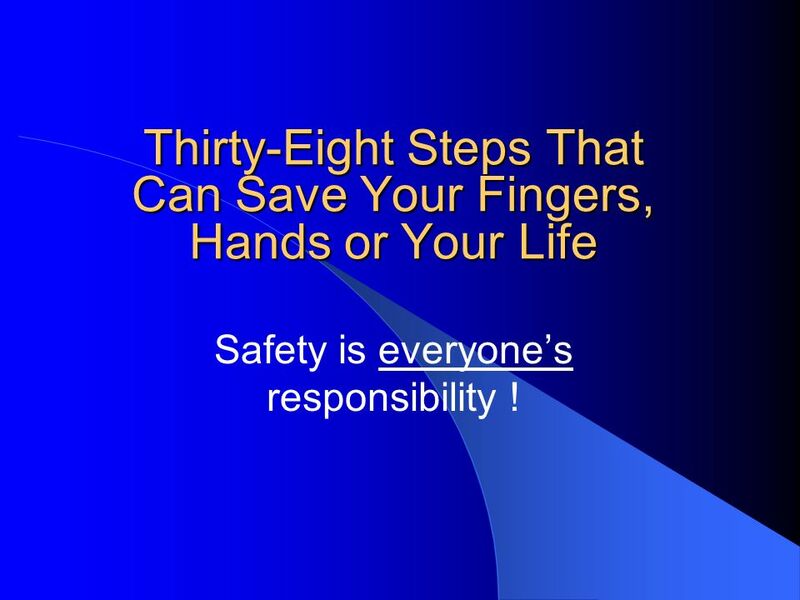 6 Thirty-Eight Steps That Can Save Your Fingers, Hands or Your Life Safety is everyones responsibility ! 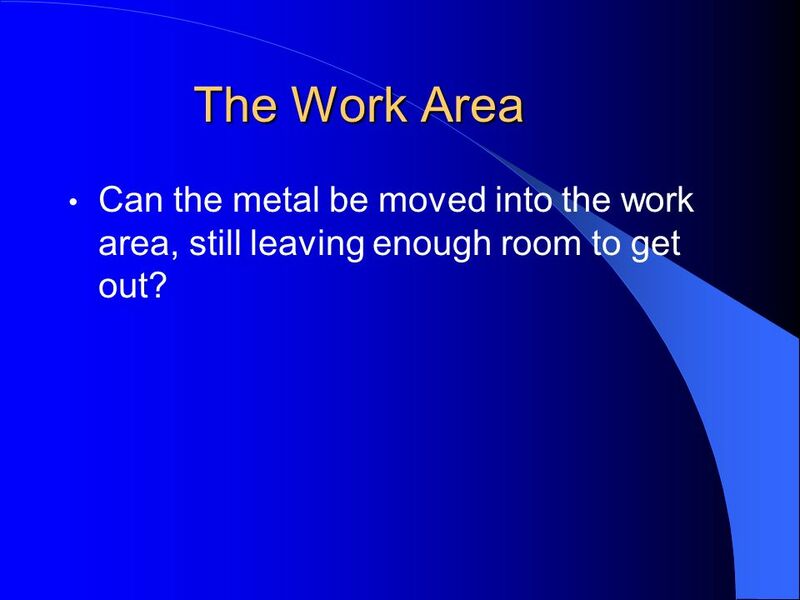 7 The Work Area Can the metal be moved into the work area, still leaving enough room to get out? 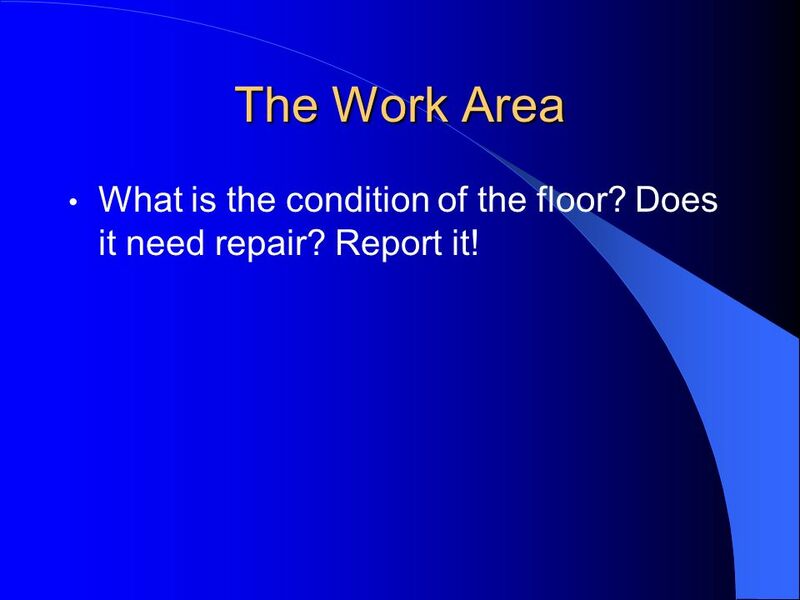 8 The Work Area What is the condition of the floor? Does it need repair? Report it! 10 Press Integrity Are all the bolts tight? Are there any visible cracks? 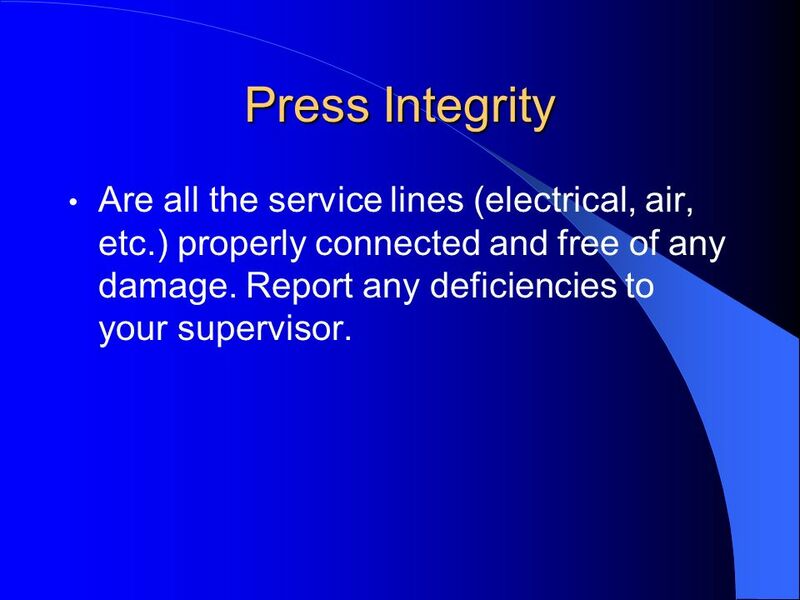 11 Press Integrity Are all the service lines (electrical, air, etc.) properly connected and free of any damage. Report any deficiencies to your supervisor. 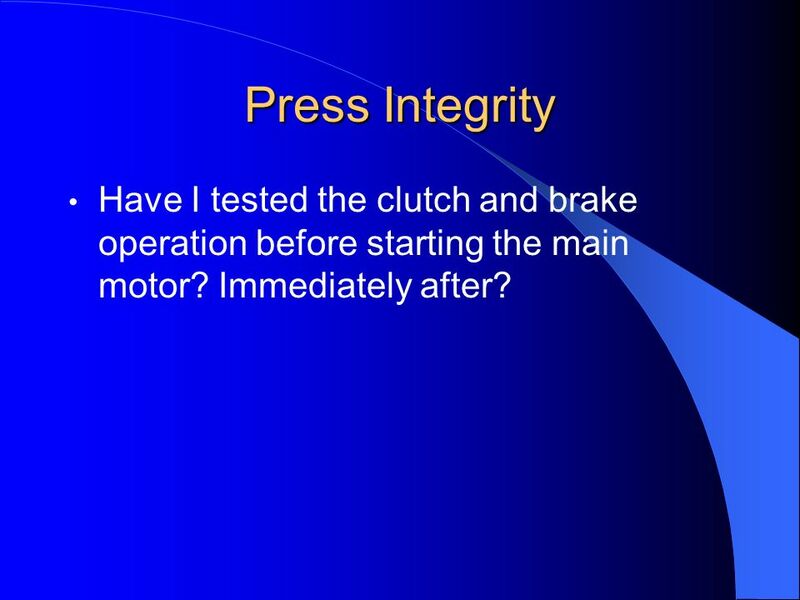 12 Press Integrity Have I tested the clutch and brake operation before starting the main motor? Immediately after? 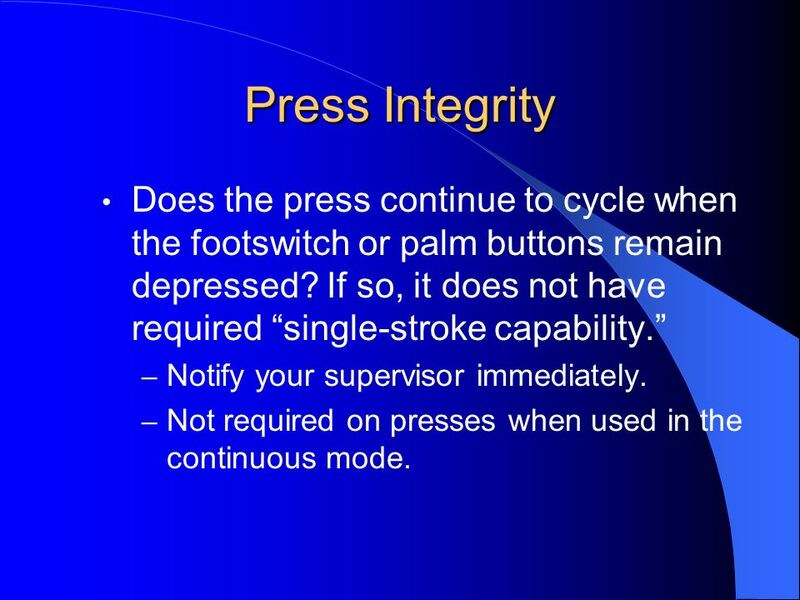 13 Press Integrity Does the press continue to cycle when the footswitch or palm buttons remain depressed? If so, it does not have required single-stroke capability. – Notify your supervisor immediately. – Not required on presses when used in the continuous mode. 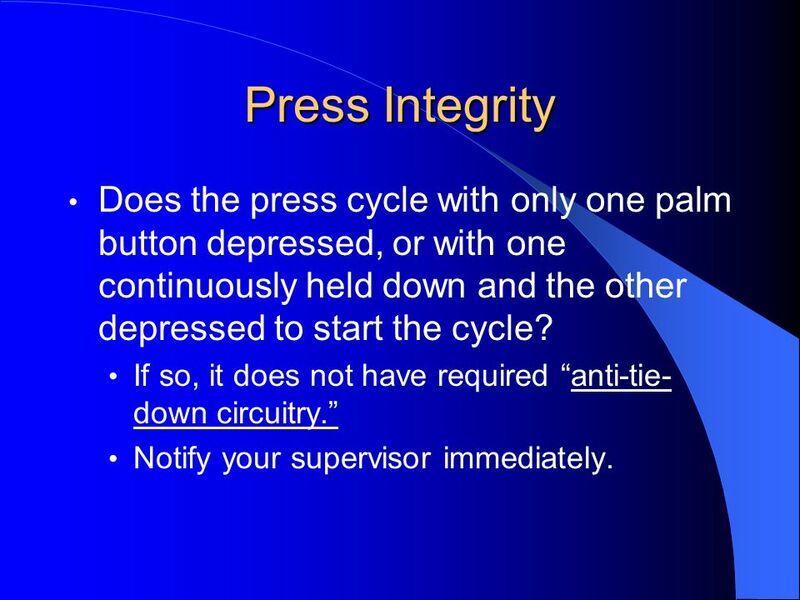 14 Press Integrity Does the press cycle with only one palm button depressed, or with one continuously held down and the other depressed to start the cycle? If so, it does not have required anti-tie- down circuitry. Notify your supervisor immediately. 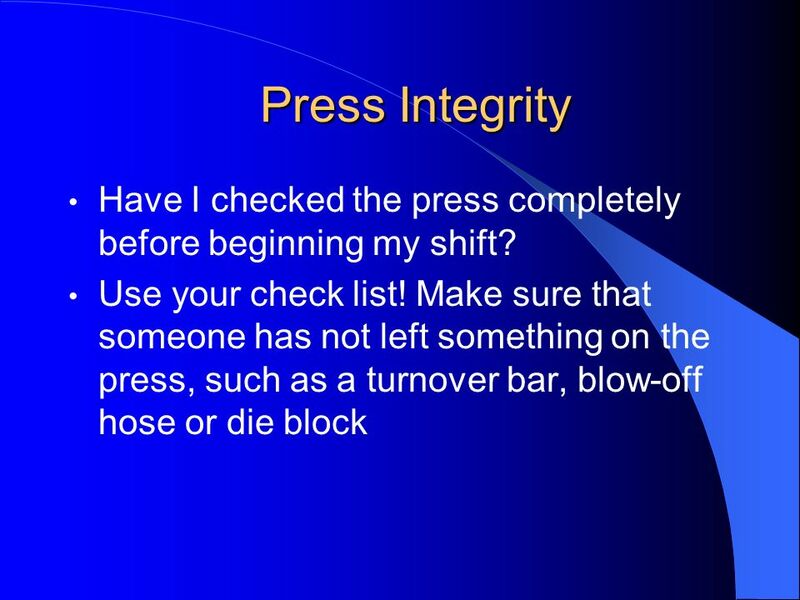 15 Press Integrity Are the operating controls (mode selector, palm buttons, foot switch, top stop, emergency stop) in good working condition? 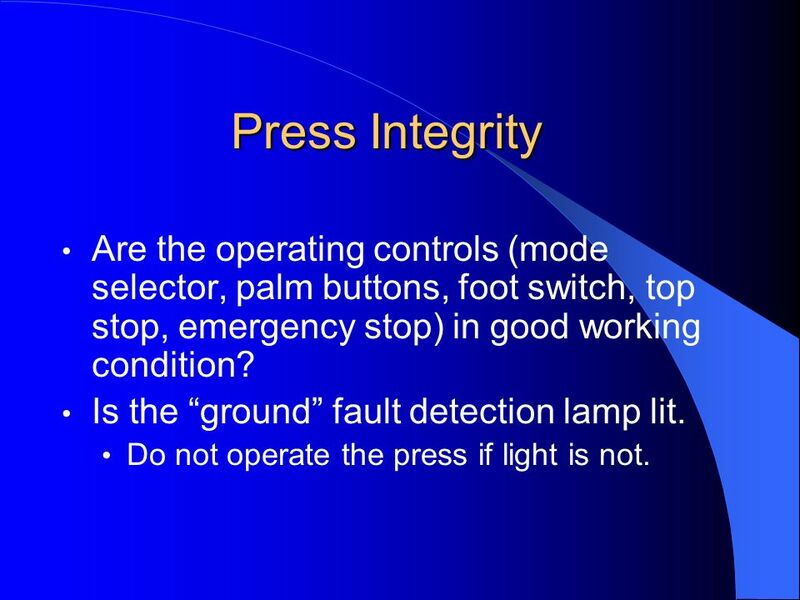 Is the ground fault detection lamp lit. Do not operate the press if light is not. 16 Press Integrity Is all of the auxiliary equipment (roll feed, scrap chopper, blow off, etc.) in good working order? 17 Press Adjustments Have I checked all the knockout adjustments? 19 Press Safeguarding Are the sides and back of the press guarded or placed in such a way that another person cannot be injured by any part of the machine? 20 Press Safeguarding Is the safety guard sturdy and secure? 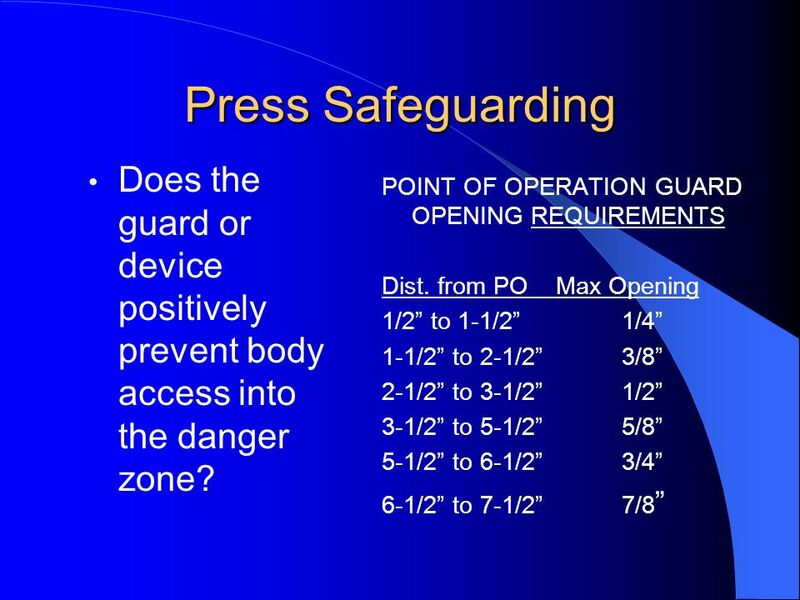 Does the safety device work properly? 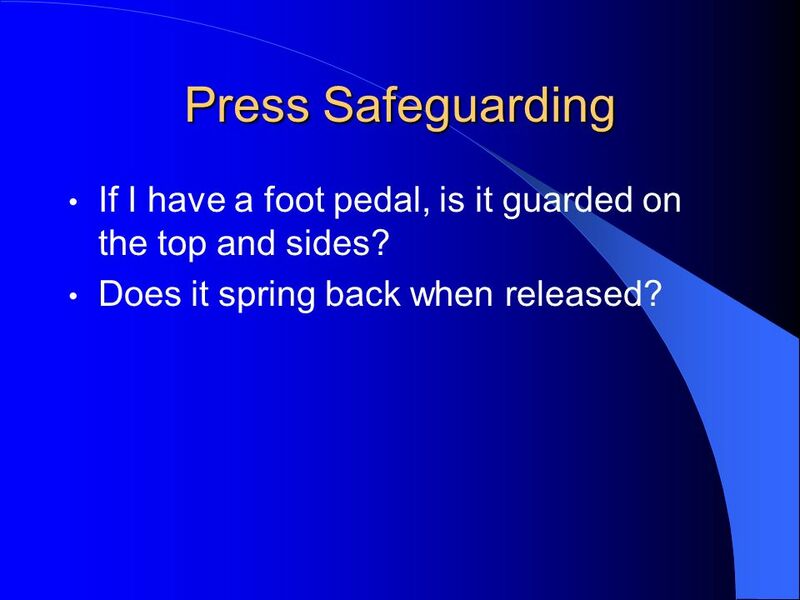 21 Press Safeguarding If I have a foot pedal, is it guarded on the top and sides? Does it spring back when released? 22 The Point-of-Operation Is the die area clean? Have all slugs and debris been removed? 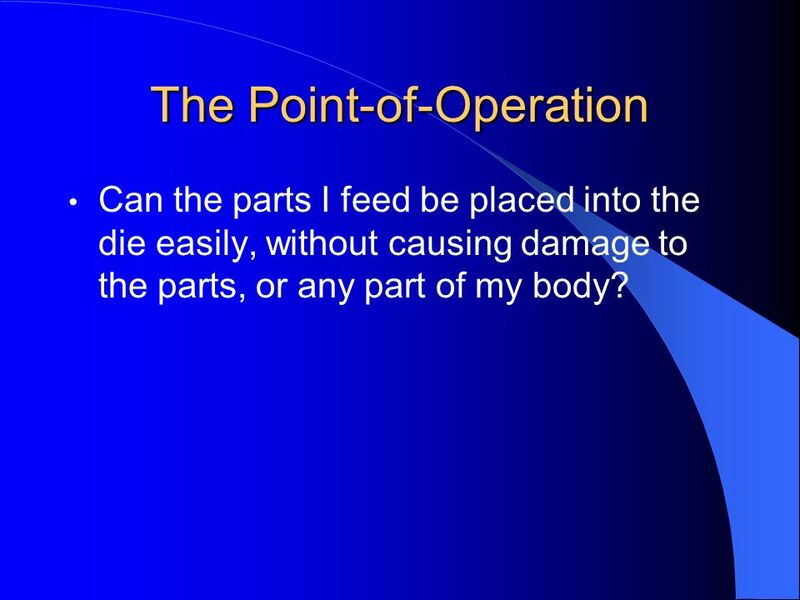 23 The Point-of-Operation Can the parts I feed be placed into the die easily, without causing damage to the parts, or any part of my body? 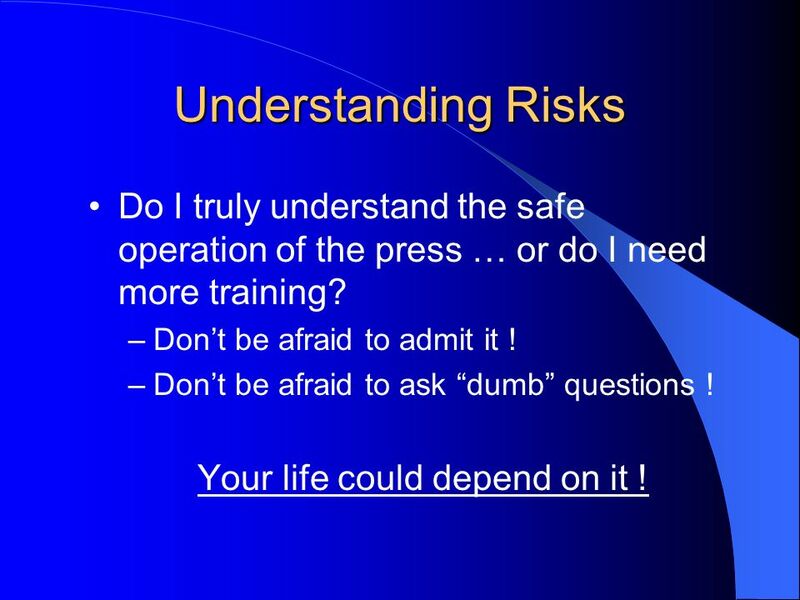 24 Understanding Risks Do I truly understand the safe operation of the press … or do I need more training? –Dont be afraid to admit it ! –Dont be afraid to ask dumb questions ! Your life could depend on it ! 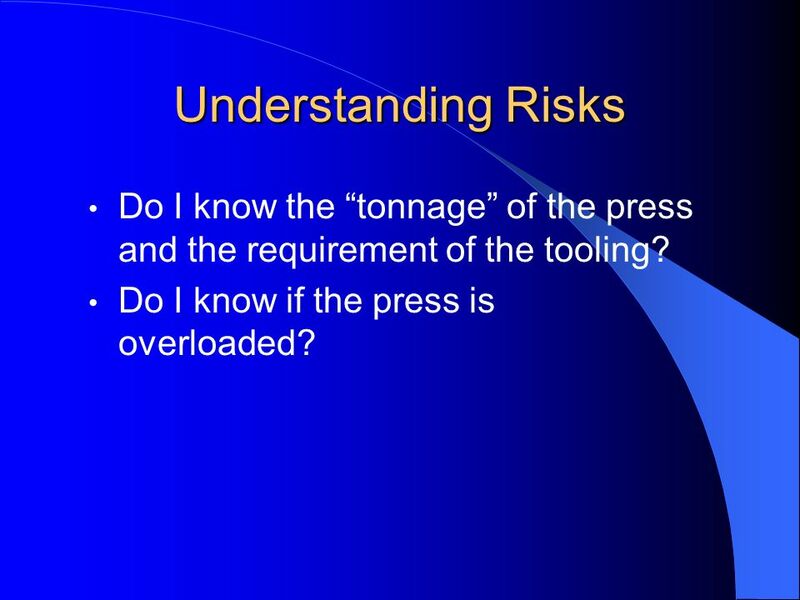 25 Understanding Risks Do I know the tonnage of the press and the requirement of the tooling? Do I know if the press is overloaded? 26 Understanding Risks Do I understand the maximum thickness or gauge and type of metal which the tooling and press can safely run? 27 Press In Operation Does the machine operate smoothly and sound O.K.? Any squealing? Shuttering? Clicking? Clanking? Excess vibration? 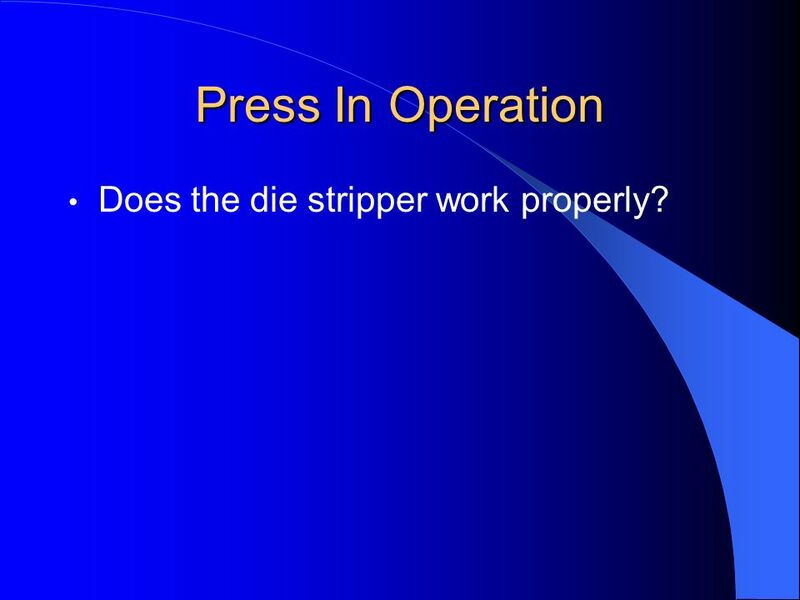 28 Press In Operation Does the die stripper work properly? 29 Press In Operation Does the take-up reel work properly? 30 Press In Operation In operation, does the die bind or jam? If so, notify your supervisor. The problem may be the tooling, the press, or the stock/part. 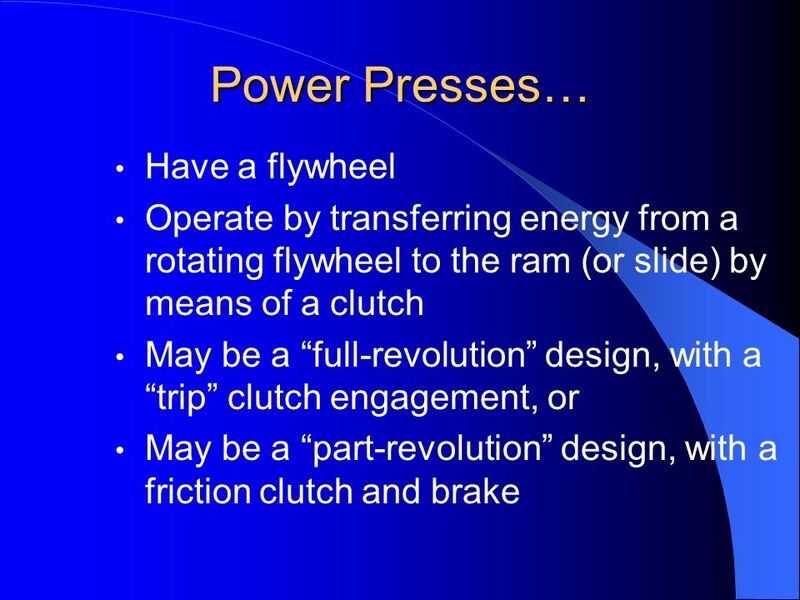 31 Press In Operation Does the clutch/brake work properly. In the case of a full revolution press, does the drag brake stop the press at top center? 32 Understanding Risks What is the expected Noise Level? Do I need hearing protection? 33 Read and Heed! Never unnecessarily place your hands or any part of your body in the machine! 34 Read and Heed! Never operate this machine without proper eye, face and body protection! 35 Read and Heed! 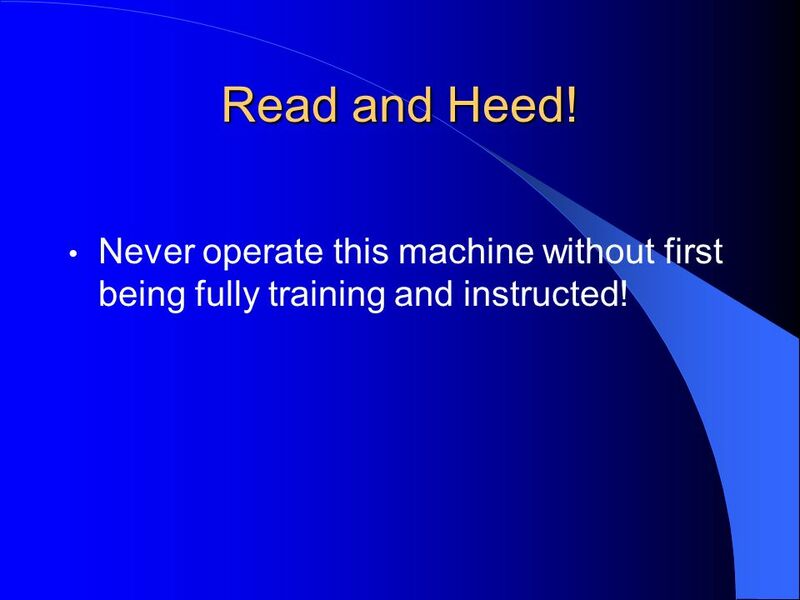 Never operate this machine without first being fully training and instructed! 36 Read and Heed! Never operate this machine without first reading the manufacturers instruction manual! 37 Read and Heed! Never operate this machine if it is not working properly! 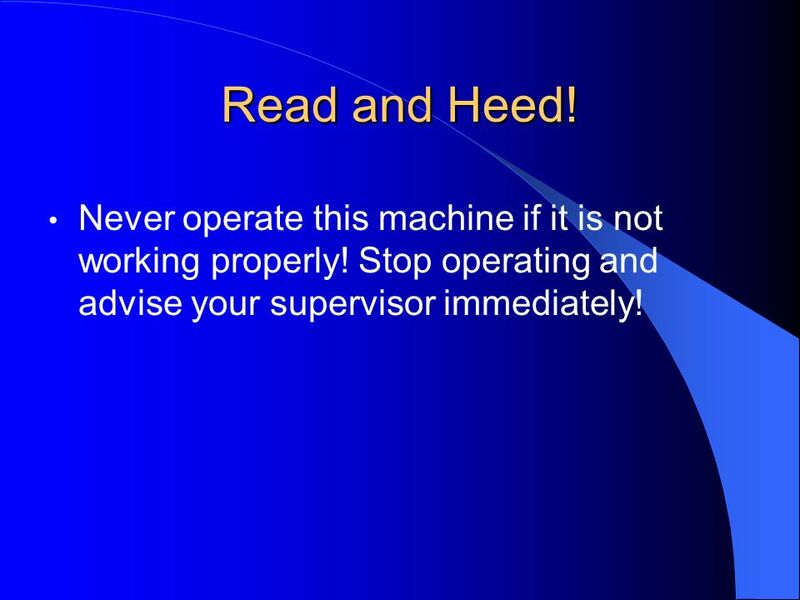 Stop operating and advise your supervisor immediately! 38 Read and Heed! 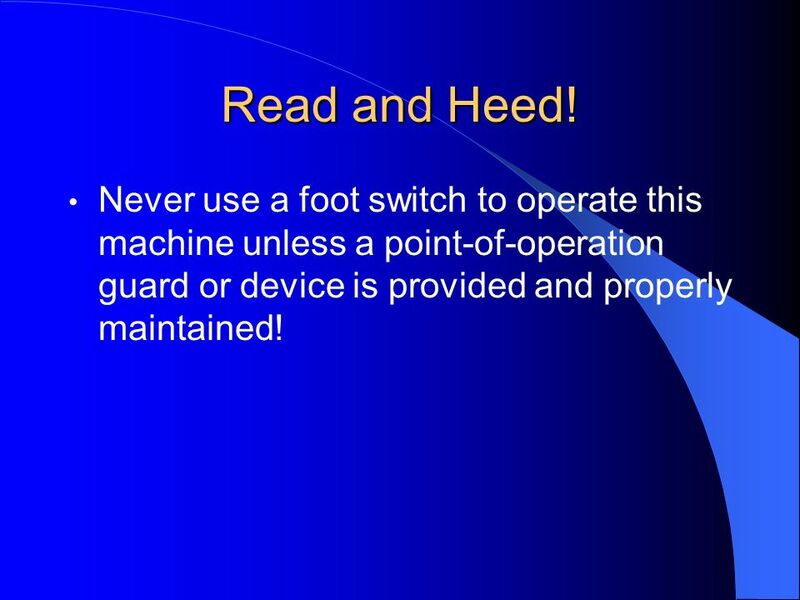 Never use a foot switch to operate this machine unless a point-of-operation guard or device is provided and properly maintained! 39 Read and Heed! 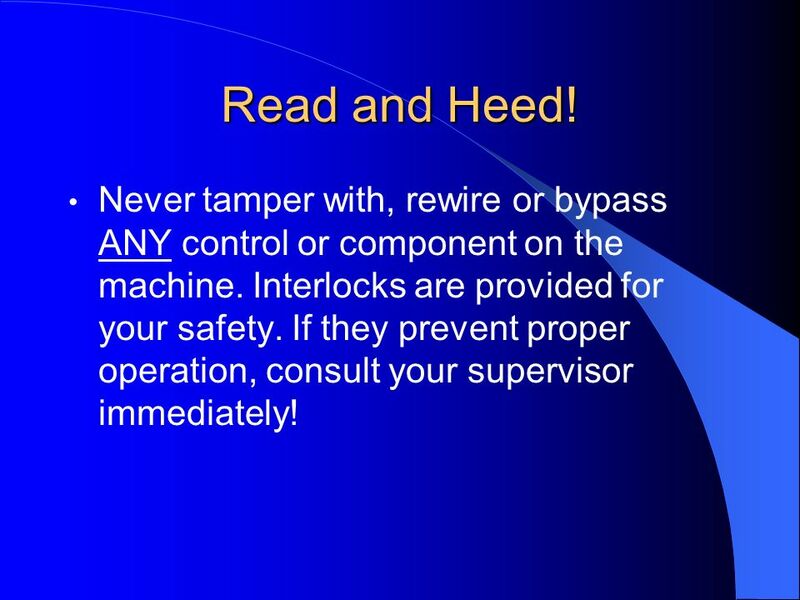 Never tamper with, rewire or bypass ANY control or component on the machine. Interlocks are provided for your safety. If they prevent proper operation, consult your supervisor immediately! 40 Read and Heed! 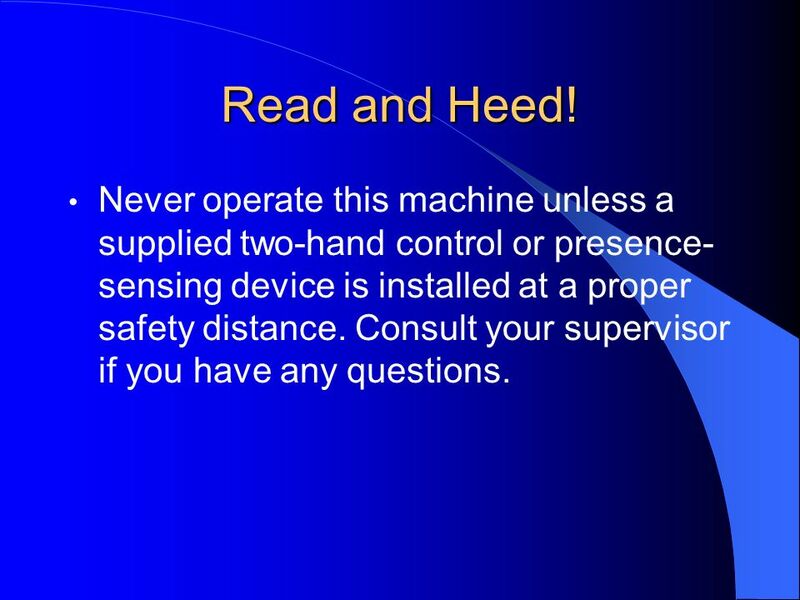 Never operate this machine unless a supplied two-hand control or presence- sensing device is installed at a proper safety distance. Consult your supervisor if you have any questions. 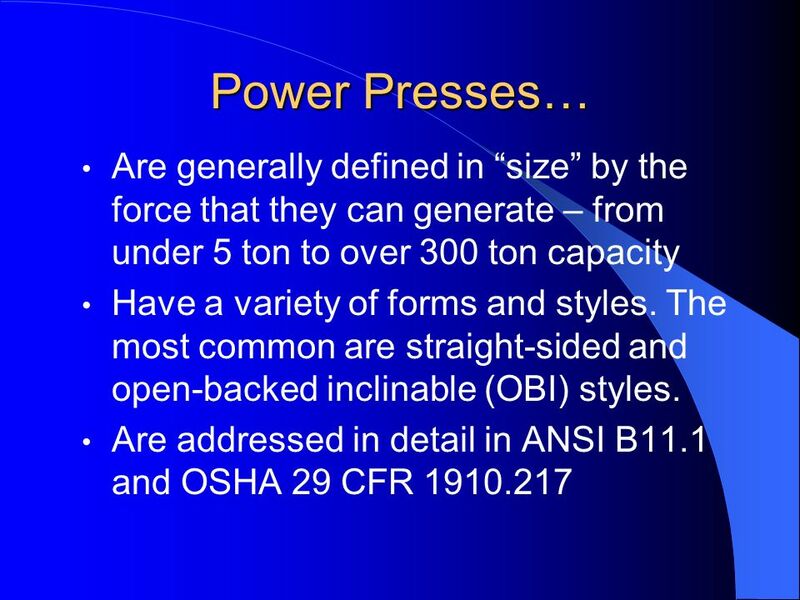 My Life Monday What do you know about overhead crane safety? 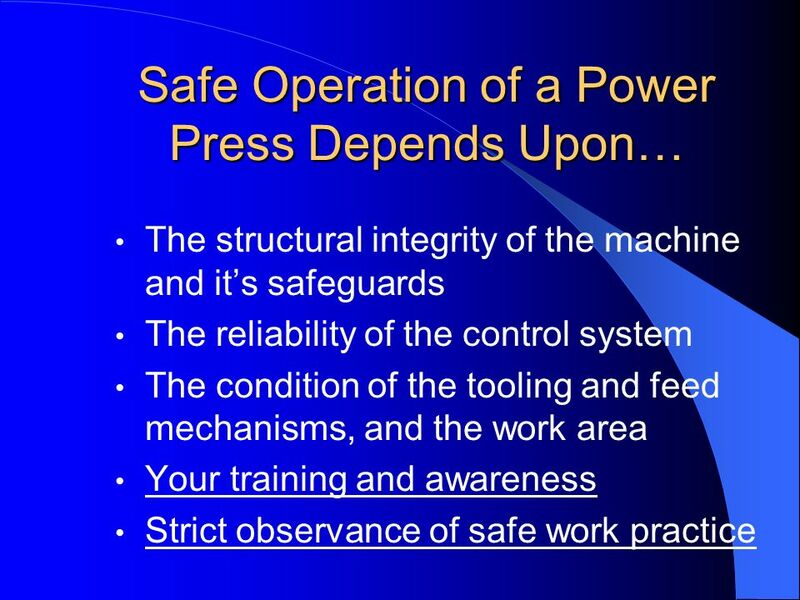 Overhead crane safety may not be relevant to all staff but dont you think it would be interesting. 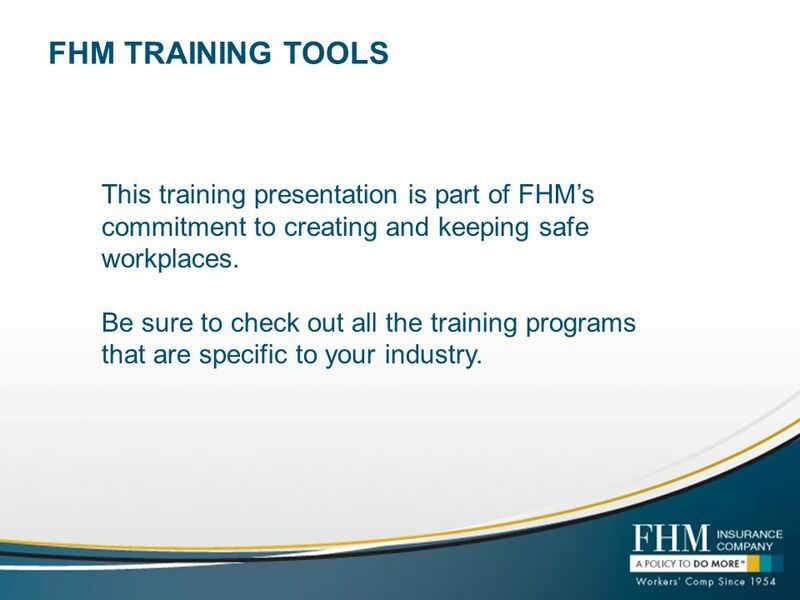 © the Design and Technology Association Health and Safety Training Standards in Design and Technology S8HS PLANER/THICKNESSER MACHINE Specialist Extension. 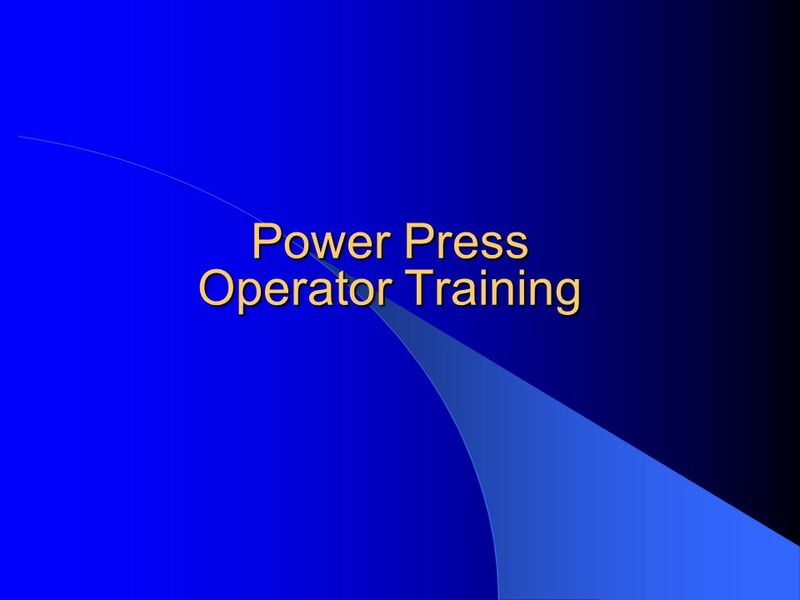 POWER PRESS OPERATOR TRAINING Robert N. Andres, CSP, CMfgE OSHEX – ESA Consulting Services © RNA, 1999. 1 Risk Management Department Ladder Safety July, 2006. 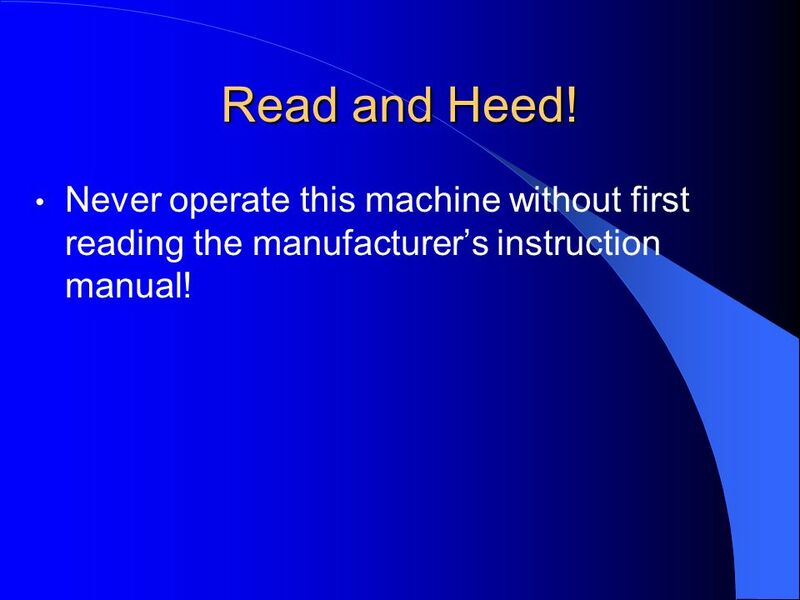 Research & Development Machine Safety Information. Motorized Tongue Jack Owners Manual Model SAFETY WARNINGS * Read, understand and follow all instructions before installing and/or using product.